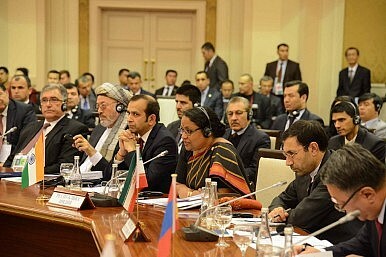 Indian Foreign Secretary Sujatha Singh addresses the SCO. The Shanghai Cooperation Organization’s (SCO) Council of Heads of Government meeting in Tashkent in the last week of November 2013 saw a growing enthusiasm from India for a more proactive role in Central Asia. The comments made by Indian Foreign Secretary Sujatha Singh at the conference is a clear indication that New Delhi has already committed to initiating steps to apply for a full membership of SCO. For some time, Russia has seemed to be uneasy over Beijing’s expanding influence in what it regarded as its traditional sphere of influence in Central Asia, yet the two countries share a common concern over U.S. moves internationally. Moscow regards the U.S.-led efforts to oust Syrian President Bashir al-Assad as a major threat to Russian interests in the Middle East that would pave the way for regime-change in Iran. China has backed Russia in opposing Western interventions in Syria and Iran, the latter a major Chinese oil supplier. Washington also has reservations about the expanding Eurasian integration under Russian and Chinese auspices. Former U.S. Secretary of State Hillary Clinton had warned that the U.S. was determined to offset Moscow’s attempt to “re-Sovietize” the Central Asian republics. It may be noted that Russia, Belarus and Kazakhstan signed an agreement during this time based on a proposal by Russian President Vladimir Putin to form a Eurasian Union with a Eurasian Economic Commission, along similar lines to the European Union, by 2015. Some analysts are predicting that the body could expand to include not only former Soviet republics, but ex-Eastern bloc countries like Hungary and Bulgaria, as well as China and Mongolia. India’s quest to become a full-fledged member of the SCO is a reflection of its desire to diversify its trans-regional ties in the emerging regional order in Eurasia. Among the factors encouraging this, geopolitical proximity may force India (and China for that matter) to expand its strategic relations to secure energy supplies. No matter what it implies for their neighbors’ navigation rights, India and China may develop common strategic interests in ensuring stability in the South China Sea, although New Delhi has not had much to say about Beijing’s claims of sovereignty in this region. There is also obviously a meeting ground between some of India’s interests and the priorities of the SCO. Since its beginning in 2001, the SCO has focused on fighting terrorism, separatism and religious extremism, areas of clear interest for India. The projected SCO Free Trade Area, to be in place by 2020 to economically integrate all members of the SCO, is also appealing to New Delhi. Observers say that it could be more attractive than the West’s offer to admit India to the Asia-Pacific Economic Cooperation (APEC) forum, and worry that India’s full-fledged accession to the SCO might be a setback for the U.S. However, India’s interest in expanding its trans-regional ties with SCO has a historical-cultural context too. Indian traders and travelers also used the Silk Road, and Buddhism spread across the vast Eurasian plains from India. Interactions between India and Central Asia manifested through the movement of peoples, goods and ideas, including spiritual interfaces. At the SCO Summit in Beijing, in 2012, India said that it would be happy “to play a larger, wider and more constructive role in the SCO as a full member, as and when the organization finalizes the expansion modalities.” India also welcomed the general trajectory of the SCO towards expansion and redefinition of its role “to deal more effectively with the common challenges of security and development in our region.” At last month’s SCO meeting, then, India’s foreign secretary was simply echoing New Delhi’s long-cherished desire to be a major player in the Eurasian region. New Delhi sees connectivity with countries under the SCO as crucial to augment India’s trans-regional ties. It is clearly ready to work with regional entities to bridge Central and South Asia. In areas ranging from information technology and entrepreneurship to energy and disaster management, India and the SCO look set to accelerate the pace of cooperation in the years to come. India’s Quest for Energy in Central AsiaChina Is Winning the War for Nepali BuddhismIndia’s Sikh Sensitivities and Canadian PoliticsIndia Doubles Down on Chabahar GambitCan Bhutan's New Government Avoid Doklam 2.0?